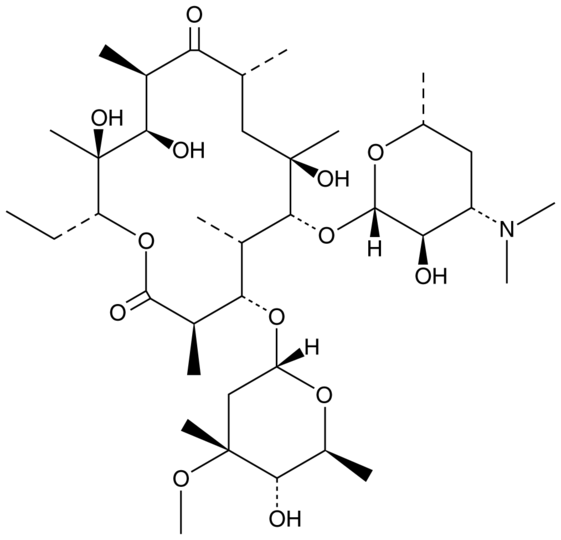 Erythromycin is a macrolide antibiotic that inhibits bacterial protein synthesis by targeting the 50S ribosomal subunit, blocking the progression of nascent polypeptide chains. It is effective against a host of bacterial genera, including Streptococcus, Staphylococcus, and Haemophilus (MIC90s range from 0.015-2.0 mg/l). Erythromycin is known to potently inhibit the cytochrome P450 isoform CYP3A4, which can affect the metabolism of numerous clinically relevant medications.